Beautifully delicate, this charming 9ct yellow gold bracelet has a charming twisted design. Interspersed with silky cultured freshwater pearls for an elegant look. 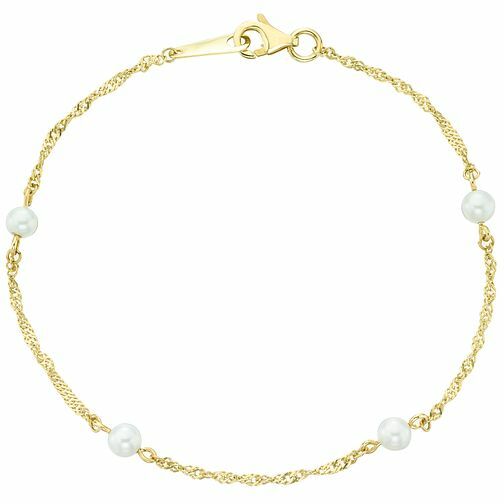 9ct Yellow Gold Cultured Freshwater Pearl Twist Bracelet is rated 4.5 out of 5 by 4. Rated 5 out of 5 by Anonymous from Beautiful delicate bracelet Love this pearl bracelet. Excellent value. I have received many positive comments about it. Rated 4 out of 5 by Anonymous from Beautiful and elegant This product is lovely. Suitable for those who love jewellery with detail. It’s a small piece but very elegant.